Kevin Schwantz was in the commentary box on Saturday afternoon for 10 minutes that turned into 40 because Jorge Lorenzo's four-cylinder Yamaha engine decided to explode into a million pieces halfway through qualifying. Red-lining it in each gear means that MotoGP engines are doing 300 revs a second. The thing had no chance. The 1993 world champion leaned over to the right of the box, craning his neck towards the first corner where there was a load of very white smoke. We soon knew where it was coming from and what it had then caused as Ben Spies and the helpless Randy de Puniet hit the oil at unabated speed. De Puniet careered into the gravel and clipped the front off Spies' Yamaha with his legs in the process. Amazingly the Frenchman was out there the next day aboard the #14 RC 212V, but turned out to be the unluckiest person in Germany as he then had his leg run over by Mika Kallio in the race-stopping incident. It was such a horrendous injury that it took the doctors 38 minutes to get his boot off while he screamed in pain. People had to leave the medical centre, so chilling were his screams. 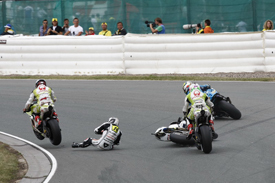 Was de Puniet's Saturday crash part of the reason why he fell on Sunday's race? We'll never know, but you just can't help but think that it might have been a contributory factor aboard a bike with 240+ bhp and with legs that were a bit tender. "It's strange to see a MotoGP bike crash there..." said his team boss Lucio Cecchinello on Sunday evening. It was, yes, and the more I think about it, the odder it seems because no one else went down there all weekend. With de Puniet and Aleix Espargaro injured in that incident, and Alvaro Bautista not allowed to start due to the crystal clear rule that you have to ride your bike back to the pits in order to take the restart, plus Colin Edwards having fallen off earlier, and Mika Kallio tipped off on the very first turn of the restart, there were only 12 bikes in the race. It all looked a bit thin. So was all of this was down to the engine limits of just six engines per entry for 18 races? In other words, could you blame the rules for Lorenzo's engine failure and that engine failure for inadvertently leading to de Puniet's field-decimating Sunday crash too? If you do 600km over a grand prix weekend then that's 10,800km over the season - which translates to 1,800km per engine from Qatar to Valencia. But for the privateers it's more of a stretch as they have to do the three pre-seasons tests and the two Monday tests at Jerez and Brno with their season's six engines. That then means that the LCRs and the Interwettens are doing 15,300km on those six motors, leaving them to do 2,550km each engine. When Lorenzo's four-cylinder blew up on Saturday at what he confirmed, publicly, to be 1,500km, I got my calculator out. Sure, the Yamaha works engines only have to do 1,800km each, but they are being stressed further because they have more revs than the privateer bikes, and top end revs cost money. That's probably all under control with Yamaha and its experience, but what if it loses an engine with a humongous crash where Jorge spills off, but the bike cannons into a barrier at 200km/h and gets some armco puncturing the block? It'll be in the skip before it's cold. Suzuki has been granted an extra three engines for the remainder of the 2010 season – 50 per cent more than the others to make it nine it can use. There may well be some ructions within the paddock as to why Suzuki should get a break. Is it because it is thinking of leaving? One would be hugely disappointed if it did, but in terms of results, it would be understandable. There is form in this area with Kawasaki already having pulled out over Christmas 2008. Dorna must be terrified every time there is a +81 Japan code telephone call flashing up on its screen at the moment. Maybe the call has come already and this is one way of appeasing Suzuki? All the other manufacturers surely must have been consulted about this, and they must have agreed to it because in all honesty, Suzuki is hardly a threat is it? However, given that Suzuki has just been given a break before even 50 per cent of the championship has taken place, what must the other teams be thinking in the back of their minds? Repsol Honda has looked after its engines diligently and carefully, but could it ask that its helping hand will be that it could bore out its remaining engines to 850cc...? Might Ducati ask that it only uses five engines, but put a 990cc rip snorter back in...? Looking back, it's easy to be clever after the event, but why in heaven's name the switch was made to 800cc was ever made still seems odd. The death of Daijiro Kato on a Honda at Honda's track surely swung things. People were saying that it was the power of the 990cc bike and that it was too much for the riders. They conveniently forgot that accidents can happen anywhere with freak circumstances too. See Valentino Rossi breaking his leg in the world's largest gravel trap or Supersport rider Craig Jones losing his life at Brand Hatch in the most freakish of all freak accidents. The six engines a year rule might have looked okay, but the development needed back in Japan and Bologna with engines being thrashed constantly on dynos is not seen. Stretching slave engines to their limit and then losing them still costs cash. The metal, the engine builder and the dyno time is still the same whether the engine goes onto a dyno or into a bike, so why not bolt some of these engines into a bike and not have all of this silliness of engines blowing up behind closed doors on a wet Wednesday in April? Two of Lorenzo's six engines have blown already (the other one was at Assen) and a further two have a load of miles on them before the halfway point of the 2010 season this weekend. He must be nervous about anything else going wrong, because using any more than your six engines means you have to start from the pitlane 10 seconds after the start. Perhaps some teams exceeding the engine limits could put in a fire-breathing 150km engine just for Sunday only and see what they could do from the back...? The rules allow it! If that hasn't crossed some people's minds, then they might want to look into that for a place like Sepang because the pit exit is 0.4km ahead of the startline. The same distance advantage is true at Valencia where it takes 10 seconds for the grid to reach the apex point of the first corner, which is not too far beyond the pitlane exit. What we don't want is free practice sessions where riders are sitting around waiting for time to tick away as they daren't risk any more miles on their engines. That fills me with dread and something needs to be done about it so we don't look silly. So give everyone – and I mean the teams, the sport and the fans - a break and let the teams all have another three engines. It will be better for the sport in the long run.